Turns out, Bun Rabbit (aka Benjamin Rabbit, Mr. Rabbit and several other names…all given him by neighbors) liked out neighborhood and would stick around from then on. He must have been someones pet at one time…we tried locating his owner with out any luck. So, he became a free range pet that everyone in the neighborhood could enjoy. He had been neutered…was pretty old for a rabbit and there were no other rabbits around. He was a threat to no one nor any other species. He did plow through neighbors gardens…but we all put up with it. All visitors got to play with him. All local dogs got to chase him…with absolutely no success. He delighted kids and adults. Bun Rabbit was a star. The Department of Land and Natural Resources (the DLNR) would hear about Bun from time to time and send a guy over from Hilo to trap him (because he was a non-native and invasive species). That never went well for the trapper. 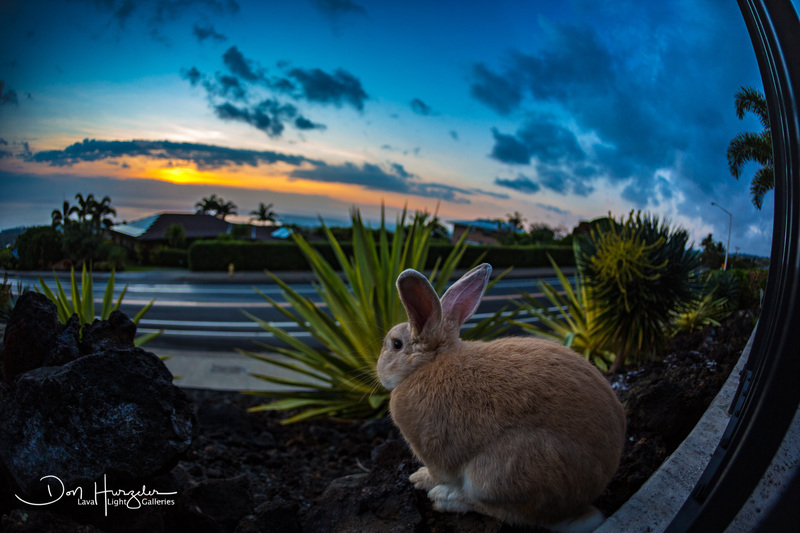 Bun was a survivor and quite a bit smarter than the guy from the DLNR. They finally gave up after we called them and told them he was old and neutered and a threat to no one or no thing. Happily for us, Bun liked our place. I would like to think it was because we were such good friends to him. Truth is…we have no dogs. So…he often lived on our property. Sometimes he lived below the kitchen window, other times behind a big rock near the driveway….in recent years he wanted to be even closer…on our lanai or next to it…or my favorite place, right outside our office door hidden away in the bushes…where we could see him and he could see us. He would sleep there all day and go hang out with his hoodlum bird friends in the evenings and early morning hours. 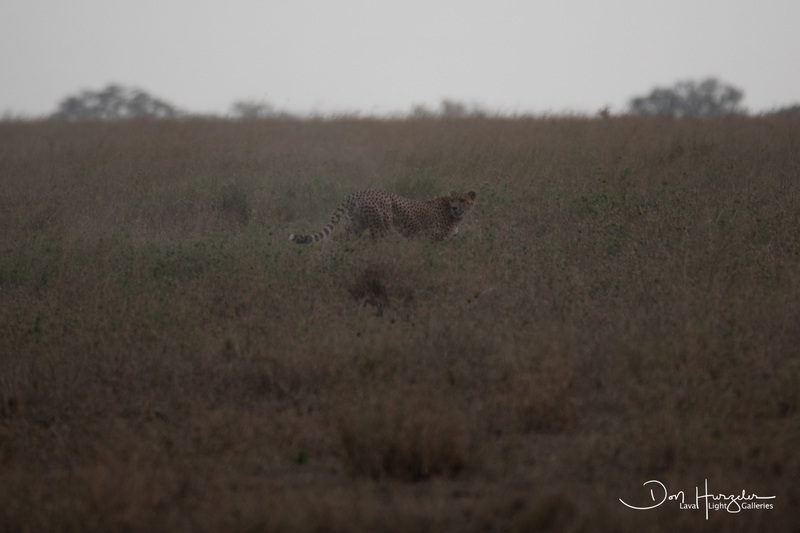 Often times I would peak into the bushes to see if he had come home from his night time feeding adventures…and there he would be with two or three of his erkle francolin (a good sized bird) buddies sleeping up against his body. Sunrise and sunset were our times together. He would come hoping in from goodness knows where and just silently show up right next to me. Other times, he would see me from a neighbors yard and come hoping across the yard and leap our rock fence in one nifty movement…stopping right by my feet. Sometimes it would be Linda who was with him…more often it was me. He was always happy to see either one of us. We put food out for him…which he always ate on top of whatever else he had eaten that night. He rarely wanted any water…had his own source on the leaves and rocks. After he ate, we would give him a back rub and then wonder out to the point on our property nearest the ocean. In the daytime, it held little interest for him. In the evening he would often sit out there with me watching the sunset…and as soon as the sun disappeared…so did he. The photo on this blog is from one of those many nights. Bun was the healthiest animal I have ever encountered. He kept himself in great shape…always well groomed…never got too fat nor too skinny. He got sick exactly once. One vet here told us he was a goner for sure and not to bother to bring him in. Another said there might be one medicine that could work. With the help of our good neighbor, Harley, we gathered him up and took him in…and force fed him medicine for about ten days. I’ll be darned…it worked and he returned to his formally happy life. That was two years ago…borrowed time for sure. Time ran out this morning. He did not look very energetic last night. For some reason I got up at 4am to check on him. He was on his last legs. I’m no vet…but he looked like he was dying of natural causes…age related. Linda came out and we quietly petted him until he fell asleep. He passed shortly after the sun came up. I am guessing he was about eight years old…old for a rabbit. A neighbor reminded me he had a pretty terrific life and lived a long time here in paradise. Still hurts. Services were private…he didn’t want to make a fuss. In case you couldn’t tell…I love that guy. Bun Rabbit…thanks for hoping in to our lives and for sticking around as long as you could. Aloha and a hui hou. Posted in Uncategorized on October 25, 2018 by Lava Light. The road from Arusha International Airport toward Tarangire National Park is a long, straight, two-lane paved highway. The road can be congested in the daytime with cars, small motorcycles, people walking, vendors hawking, animal drawn carts and small herds of animals tended by one or two Maasai. In most places, there are either bare bones retail shops or vacant land…with dust everywhere. When you do encounter people in larger groups, they tend to be colorfully dressed and fully animated…except the shop keepers who seem to be mostly women sitting in front of the stores, looking dejected and bored while waiting for a customer. Open air food vendors seem to be everywhere…cooking corn or other staples on barbecue setups of all kinds. Young men sitting on small motorcycles are omnipresent…waiting for what…I do not know. Miles down that road, our off road vehicle turned abruptly onto a fairly rough dirt road and a few miles later we were at the entrance of Tarangire National Park…a huge park that is completely vacant of any development and filled with all the creatures that nature placed there…lions, elephants, leopards, giraffes, monkeys, gazelle and on and on…a first class safari land for adventure photographers or anyone else who wants to see what nature looks like up close and personal. Midway along the road from Arusha, one of our party had to “check a tire”…code for “take a leak”. Our driver pulled over, looked around to see if the area looked safe from animals (we were now well out into the countryside or “the middle of nowhere” as I would normally call it) and pointed toward a bush. Our friend headed toward cover and we waited patiently…for about ten seconds. Out of nowhere, there was a knock on my car window. Caught me by surprise, as I saw no one there when we pulled up (my wife tells me she believes a car pulled up and four people got out when I was not looking). I noticed movement to my left…two men heading directly at our lady in the bushes. I started to jump out of the car on the left side to intervene…but the two men veered off in another direction. I then turned back to see who was knocking on my window. It was a tall, beautiful, young black lady. I pushed open my window and she said to me, in perfect English, “This is my son and he has always wanted to meet you.” I looked down, and there was her three year old, good looking, smiling son looking up at me. She then said that he wanted to shake my hand. There was no door on that side of the vehicle and I was a bit confused as to what was really going on…so I just leaned way out the window and shook the young mans hand. He got a huge grin on his face and got kind of emotional. He said something to his mom that I could not understand. As he looked back at me, she said “This is a bit embarrassing, but he would like to kiss you.” I leaned out again…even further this time…picked him up under his arms and raised him up to my level…and I then planted a big kiss on his forehead. Once on the ground, the young man stepped back, smiled that big smile of his and gave me a double shaka. A shaka is a Hawaiian hand gesture that is kind of like a “thumbs up” in meaning….thumb pointed out, little finger pointed out…middle three fingers pulled into your palm and then the whole hand is shook back and forth…a very friendly greeting in Hawaii. It kind of dumbstruck me..it was the last kind of gesture I expected to see someone give me in Africa. At that, the young lady thanked me and said I made her son very happy and she wished me well. They moved off with the young man continuing to look back and wave at me. There were four of us in the car and we all witnessed this event. We all went kind of silent, as the tire checker got back in the car and we prepared to drive off. Later I asked the driver if he had witnessed what had happened. He had and spoke briefly to her when they first showed up. He asked her if she was Maasai…as we were in the heart of Maasai territory and she did not look nor dress Maasai. She said she was not…that she had married a Maasai. The driver said this was extremely unusual…women from outside the Maasai community do not normally voluntarily sign up for the role a woman plays in Maasai life…because it can be a difficult role. But she had done so happily and lived nearby. The driver knew nothing else about her. I told him what she said to me and he guessed that what she meant was “My son has always wanted to meet an old white guy.” He is probably right…but that is not what she said and it makes a better dream story in my head and in this writing if she said exactly what she meant. I asked him about the shaka. He said it was not a hand gesture used in that part of the world and he had never seen it used by a Maasai or anyone other than a few Hawaiian visitors such as ourselves. He too thought the whole encounter was dream like and highly unusual. One last thing…as I put the young man back down on the ground after kissing him, I noticed a medical port in the back of his hand…the kind used to deliver intraveneous drugs. That gave me pause for thought. My first thought was concern for the young man…wonder what serious illness he is fighting (I have to say that he looks like he is winning that battle…what ever it is…because he looked great and perfectly healthy). My second thought was “What have I just exposed myself to?” Happy to say…it has been three weeks since that encounter and I am still healthy and still a bit confused by the whole episode with the lady and her son. I wish…I wish I had not been so startled and had taken a few photos of her and her son and asked for their names. They asked me for nothing other than the interaction. They could not have been nicer. I would love to know their whole story and never will. 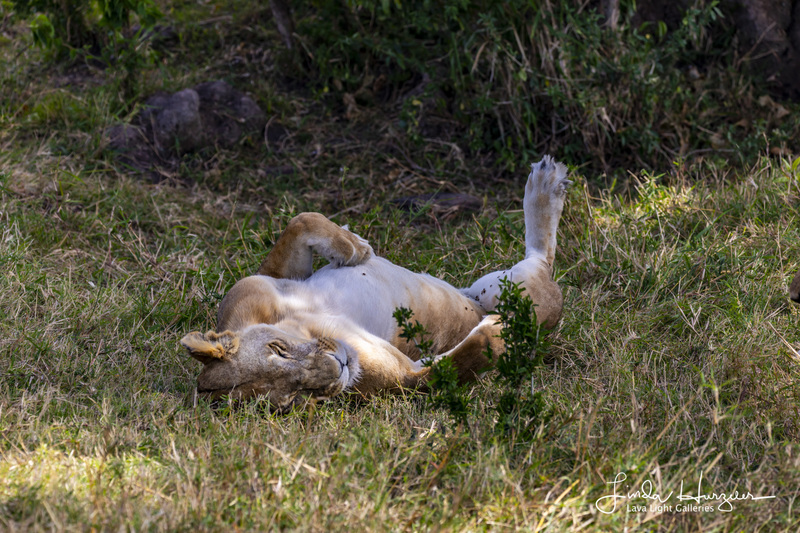 And so, for the entire safari…in between photo ops…I ran the story over and over in my head until it has now developed into a book length story that I may or may not write. If I do, 99% of it will be fictional. The one percent that will be factual will be the words written in this blog…all real and all a mystery. My welcome to Tanzania…half a world away from my home in Hawaii…and one I will never forget. Posted in Uncategorized on October 16, 2018 by Lava Light. 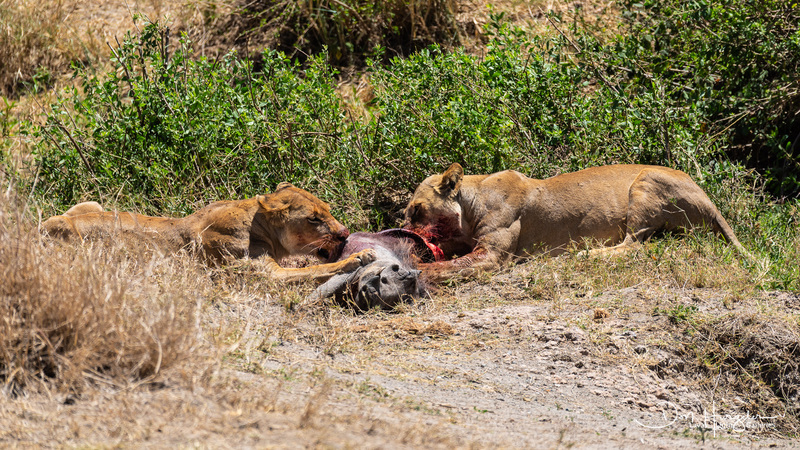 Linda and I rolled up on an amazing scene…two female adult lions with a fresh kill…a warthog. 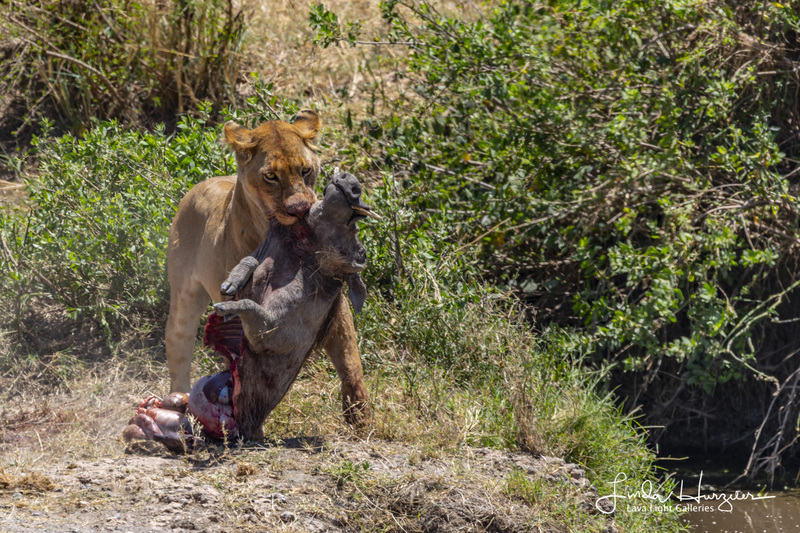 Kill is not exactly right…the warthog was still alive as it was being eaten. Made it pretty hard to watch. 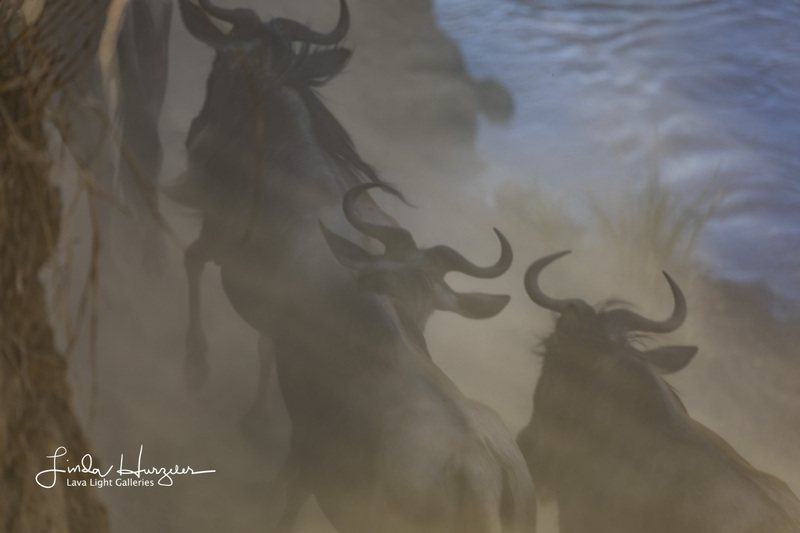 They had ambushed the warthog at a waterhole. One of them grabbed the warthog by the throat and choked it out. Good idea because the warthog has sharp tusks that can do a lot of harm…we saw the damage they can do on other lions during our safari. 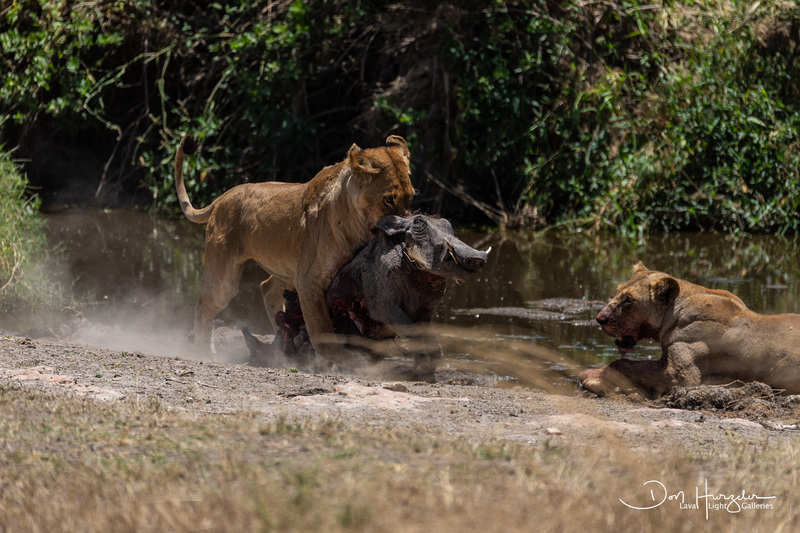 The lions ate basically the whole back end of the warthog before they filled up. By the time they were done, their bellies looked like beer kegs. 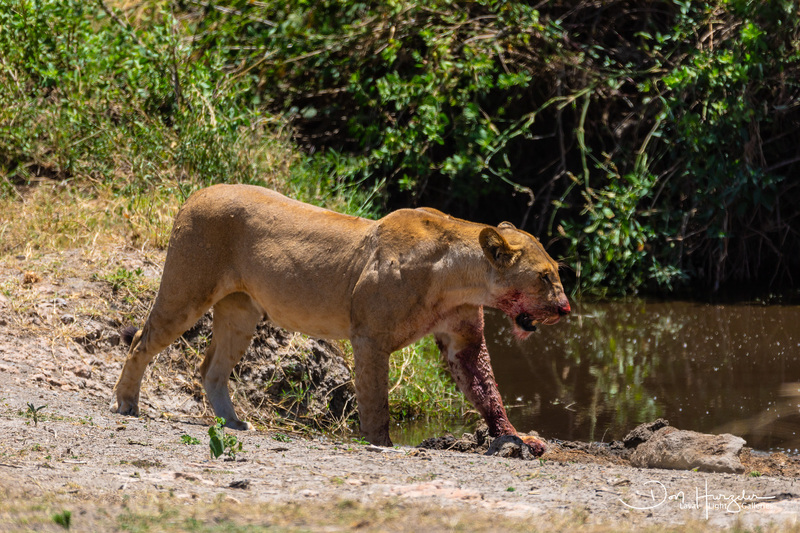 Waste not, want not…one of the lions walked off to get a drink of water and rest and the other was left with the task of dragging the carcass into the brush for later consumption. Good they protected the carcass because there were vulture on the killing ground within minutes picking at whatever had been left. We saw vultures clean up several carcasses during our safari…huge birds…20-30 at a time…tearing the animal to bits in no time. Team coverage the scene by Linda and I. 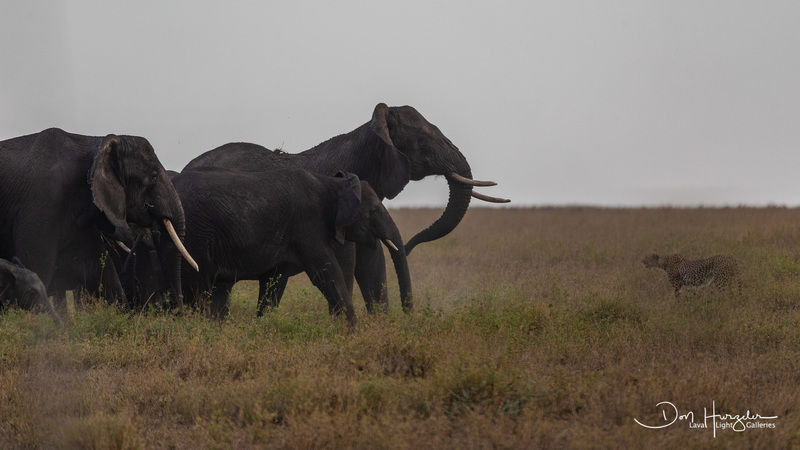 Difficult to witness…but part of the circle of life in the Serengeti. Posted in Uncategorized on October 12, 2018 by Lava Light. 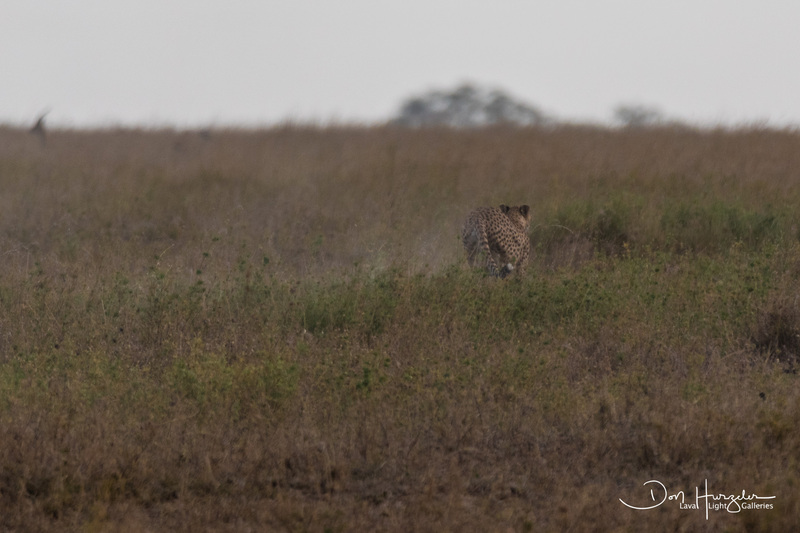 Linda and I rolled up on an area where a cheetah was chasing a juvenile Hartebeest. 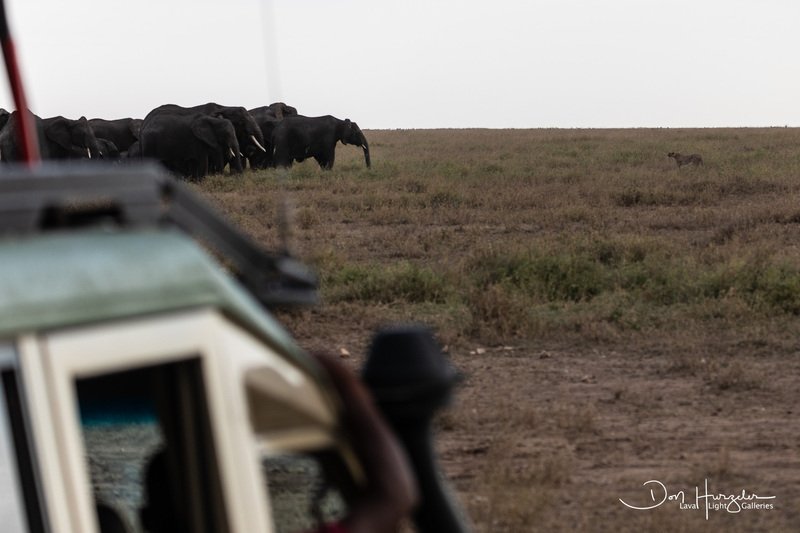 We pulled out our cameras and started to shoot the scene in front of us…right in front of us. All of a sudden, everything changed. 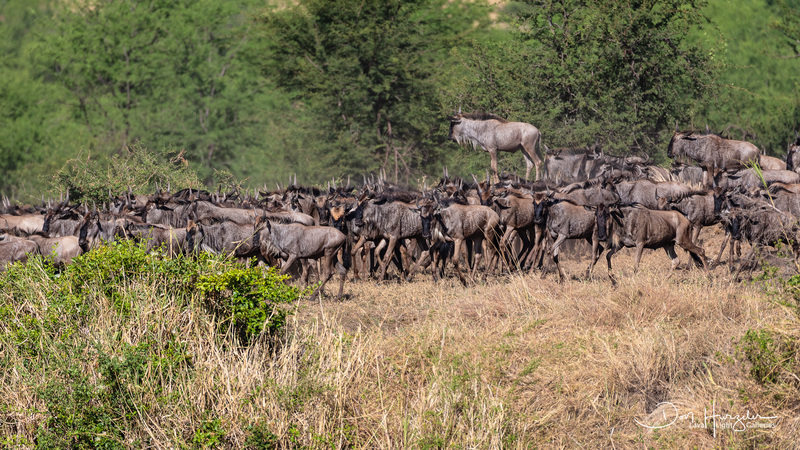 The chase for the small Hartebeest was abandoned and the tables were turned. 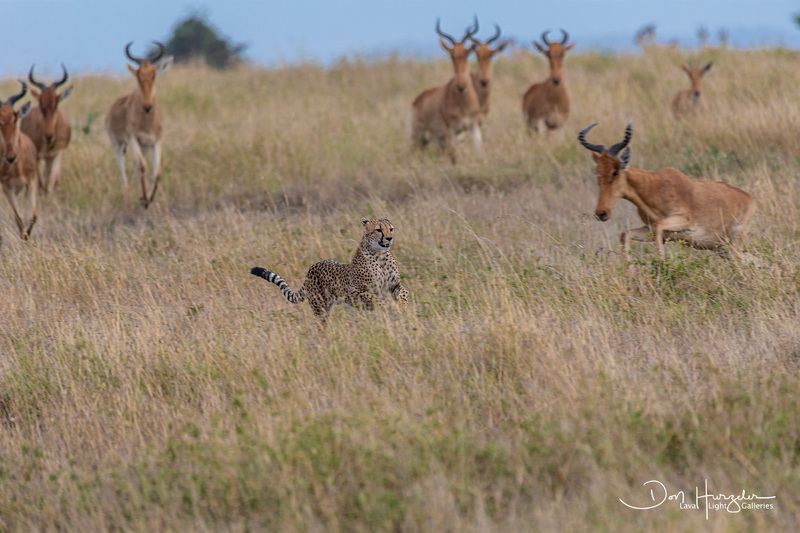 The entire herd of Hartebeest went after the cheetah. 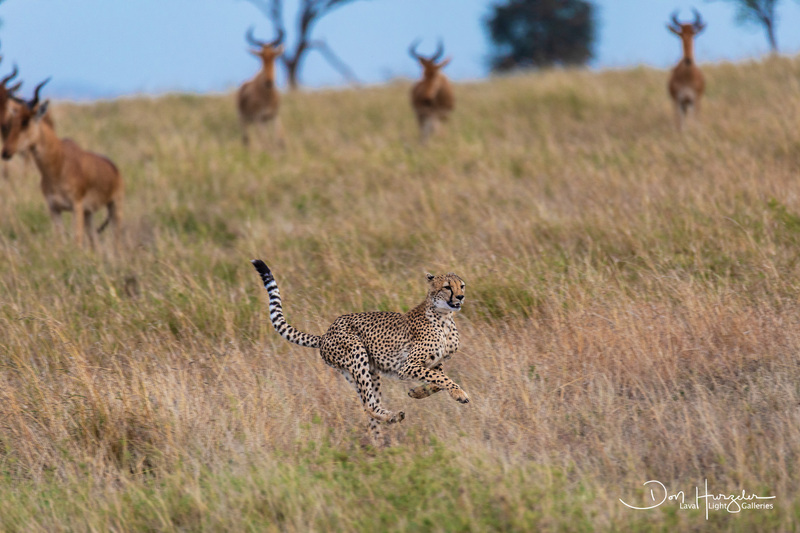 The cheetah could normally outrun them all, but she was out of gas from the first chase. 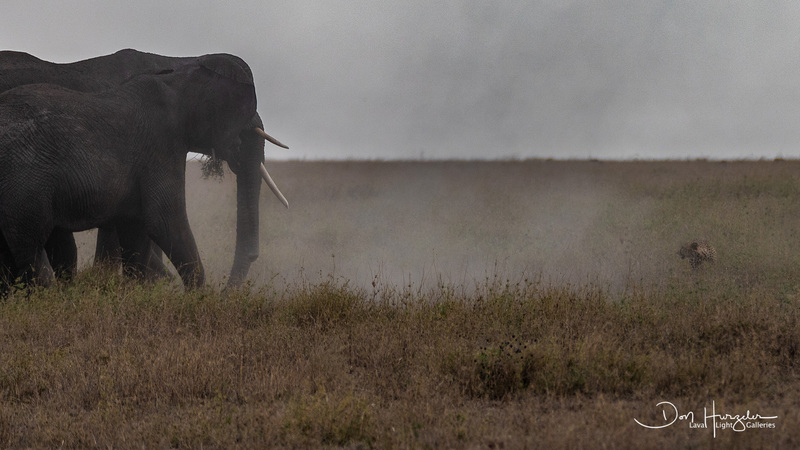 She cranked her speed up to about 70 miles per hour for just a few seconds and then started fading and fading and the Hartebeest closed in. I found myself torn as to who to root for, but really didn’t want to see any of the animals killed right in front of us. 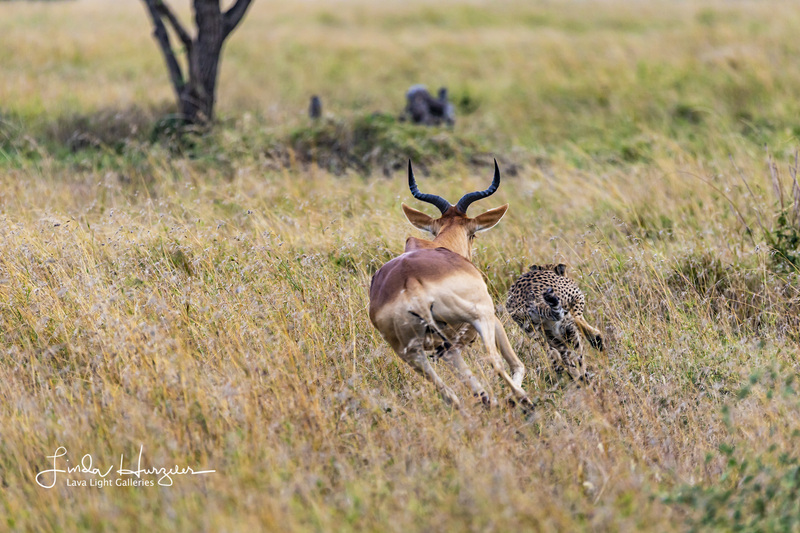 My camera held focus throughout the entire chase…save one critical frame…the frame where the Hartebeest darn near got the cheetah. Guess what…Linda caught that frame perfectly and you will see it in the attached photos. 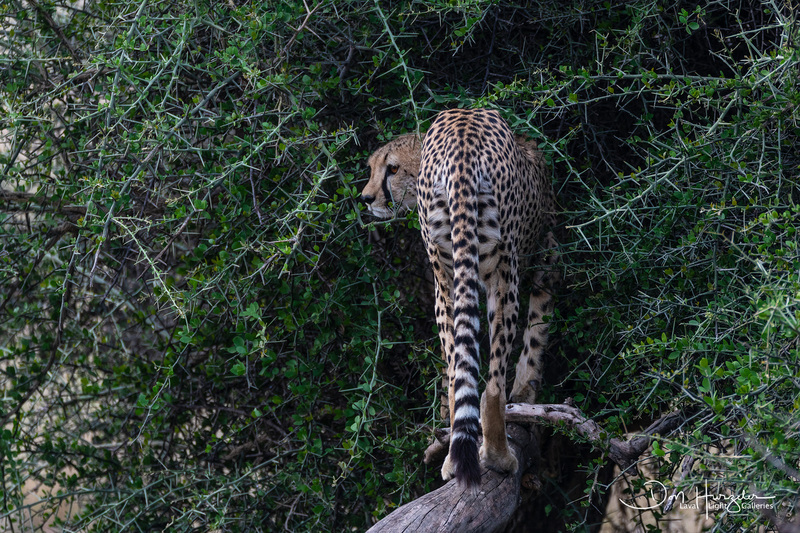 In the end, the Hartebeest veered off and let the cheetah escape by it jumping into a nasty looking thorn tree…well up off the ground and not an area where either animal would voluntarily go…the cheetah hated it, but it saved her life. I went back and looked at the time on my camera. From start of sequence to first shot in the thorn tree…just 15 seconds. In those 15 seconds, maybe 300 yards were covered…blinding speed at first and then…not so much. One lucky cheetah. Posted in Uncategorized on October 11, 2018 October 11, 2018 by Lava Light. The walls of our galleries on the Big Island are mostly filled with Hawaiian subjects…customers come into see Hawaii and that is what we want to provide for them. However, we do travel and we take our cameras along. 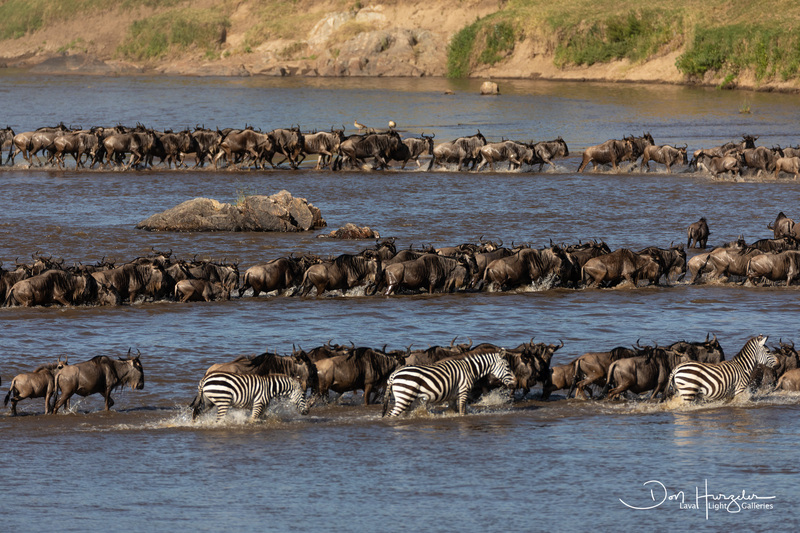 As I write this blog, CJ is in Mongolia and we just got back from Tanzania, Kenya, and Europe. 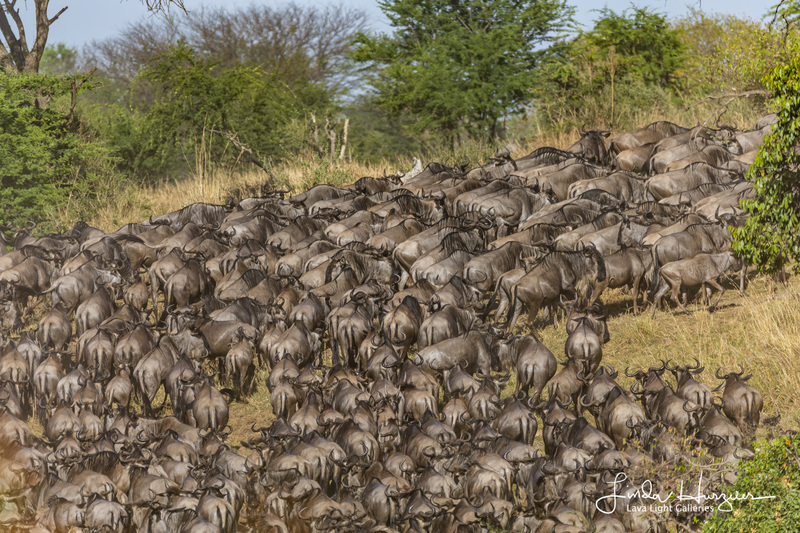 Linda and I took some 30,000 images during our photo safari of eleven days in the bush. We will probably end up with just two of those images on the walls of our galleries, but will make good use of the others in our online gallery and with a possible book. And…we can not wait to see what CJ brings home. His last trip to Mongolia he brought back absolutely amazing images. 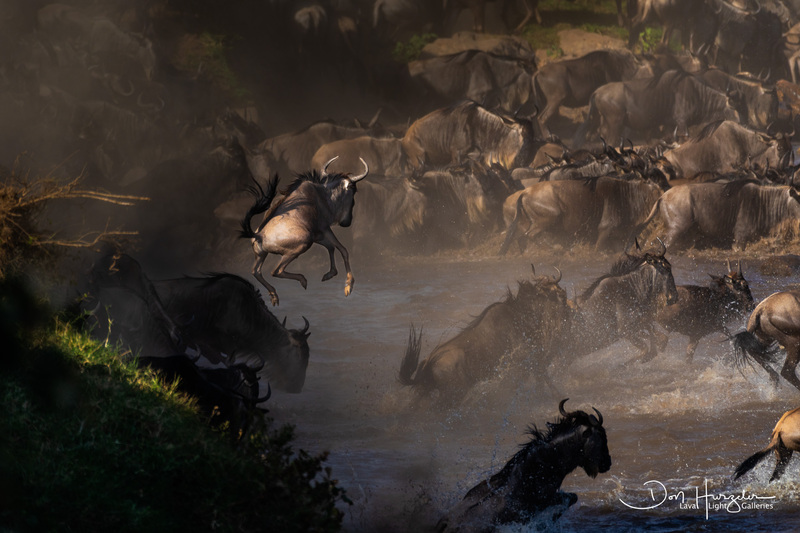 When you get a chance, take a look at our new Africa gallery on this website. It is in the larger gallery of Images from Around the World. Linda and I think the photos of some of our best ever due to the unique subject matter and conditions that allowed us to get up close and to shoot at low ISO with great gear. We’ve only posted a few here, but will be thinking about how we can post maybe 150 or so for those who are curious. The diversity we encountered was beyond our expectations. 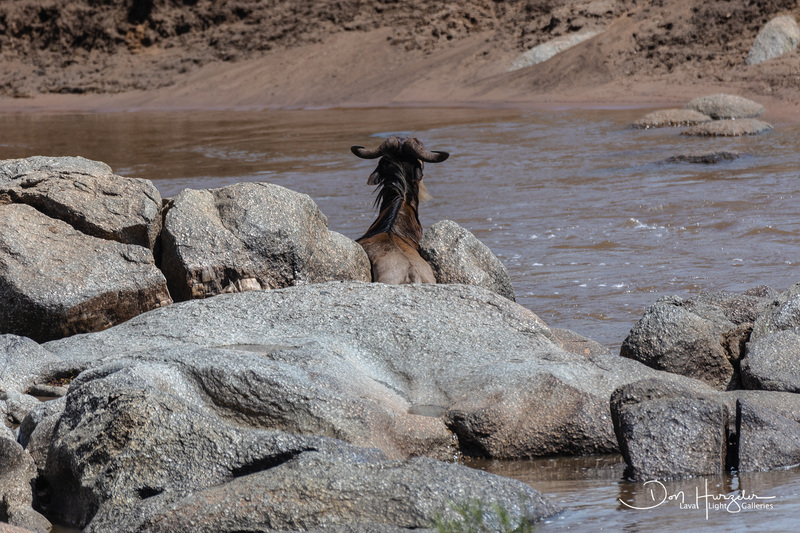 In the coming days, I will feature a photo or two from that trip in new blogs…giving some of the story of what we saw and how we managed to get the shot. So thankful for our successful trip to Africa and so very happy to be back home. Aloha. Posted in Uncategorized on October 10, 2018 by Lava Light.